Russbach is a community in the Tennengau area of Salzburg. 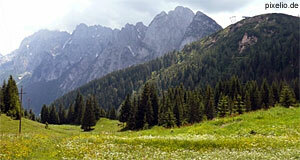 Russbach is situated in an Alpine part of this region, south-east of Hallein. It is skiing and hiking destination, but less crowded than the "famous" ski resorts of southern Salzburg. Therefore, it targets families with children rather than the rowdy lot that prefers towns like Saalbach-Hinterglemm or Obertauern. As a holiday destination, the region is advertised as "Dachstein West", which emphasises the direct access to Mount Dachstein. Russbach has approximately 790 residents. In addition to outdoor activities, Russbach offers a public pool (called "Wasserpark") that was recently opened. Since Russbach is having a hard time competing with the "big names" in the Pongau and Pinzgau areas, the town offers free shuttle services during the winter season that takes people straight to the area of Gosau and other attractive Salzkammergut skiing regions. Over-all, you can expect good and friendly service in Russbach, good value for money and a strong emphasis on family vacations. Russbach is also suitable as a base for exploring the south-western parts of the Salzkammergut, but you will need your own car to make the best out of your time there. An interesting attraction of Russbach is the Schneckenwand, a large deposit of fossilised snails of extraordinary quality. You don′t need to be interested in palaeontology in order to enjoy the Schneckenwand: It makes a very attractive hiking destination and is accessible by good roads and paths suitable for children.